Cayenne is gently warming to creaky joints, unlike the burning sensation you get with capsaicin creams. When the coconut oil is in its solid state, it stays put better on my lower back. 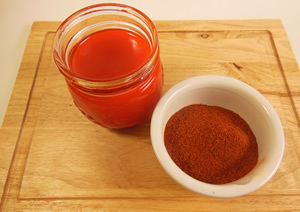 Cautions: Cayenne powder can be irritating to skin. Test your sensitivity on a small area before widespread use. After 7 to 10 days stop stirring. Keep the coconut oil warm so it does not become solid yet. Give the powder time to settle to the bottom of the jar. This can be 2 to 3 days. When the oil is clear(er), pour off the top into a clean jar, discarding the gunky powder residue . Coconut oil is solid at room temperatures below 75 degrees, so this salve becomes more of an oil in the summer if you don't keep it cool. You will want a container flexible enough that you can either pour or dip, depending on the solid/liquid state of the coconut oil.